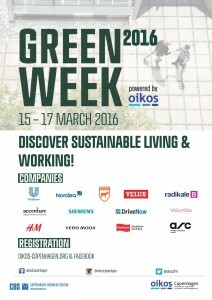 Discover Sustainable Living & Working at CBS Green Week powered by oikos Copenhagen! This year’s Green Week will evolve around the topic of Sustainable Living & Working and take place at Copenhagen Business School from the 15th to the 17th of March 2016. High-profile speakers from different companies, such as Unilever, DriveNow, H&M, Siemens and Nordea will share and discuss their thoughts on sustainability issues with you and Ida Auken from Radikale Venstre will present her ideas on “circular economies”. In addition to the lectures, there will be workshops and networking activities taking place at Copenhagen Business Schoo, Solbjerg Plads. Students from other Universities are of course more than welcome to join as well! Stay updated on when registration opens by liking oikos Copenhagen on Facebook and join the Green Week event CBS Green Week 2016. We look forward to seeing you!